Daniel Maxwell is the Henry J. Leir Professor in Food Security at the Friedman School of Nutrition, Science, and Policy. He directs the Food Security and Livelihoods in Complex Emergencies Research Program at the Feinstein International Center, and in 2016-2017, he served as the Acting Director of the Center. His recent research focuses on the re-emergence of famines in the 21st century and the politics of analyzing and declaring famine. Dan also researches food security, resilience programming and measurement, and livelihood systems under stress. He teaches courses on food security, humanitarian action, humanitarian policy, and food insecurity in situations of crisis and chronic vulnerability. 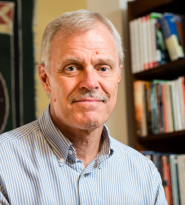 Prior to joining the faculty at Tufts, Dan worked for two decades at humanitarian agencies and research institutes in Uganda, Ghana, and Kenya. His most recent position was Deputy Regional Director for Eastern and Central Africa for CARE International. He is the author, with Nisar Majid, of Famine in Somalia: Competing Imperatives, Collective Failures (Oxford University Press, 2016). He is the co-author, with Chris Barrett of Cornell University, of Food Aid After Fifty Years: Recasting Its Role (Routledge, 2005), and co-author with Peter Walker, of Shaping the Humanitarian World (Routledge, 2009). Maxwell, D. “Measuring Food Insecurity: The Frequency and Severity of ‘Coping Strategies.’” Food Policy 21, 3 (1996). 291–303. Maxwell, D., Levin, C., Armar-Klemesu, M., Ruel, M., Morris, S., Ahiadeke, C. “Urban Livelihoods, Food and Nutrition Security in Greater Accra.” IFPRI Research Report 112. Washington: International Food Policy Research Institute. (2000). Maxwell, D. “Alternative Food Security Strategy: A Household Analysis of Urban Agriculture in Kampala.” World Development 23, 10 (1995). 1669–1681. Barrett, C. & Maxwell, D. Food Aid After Fifty Years: Recasting its Role. London: Routledge. (2005). Maxwell, D. “The Political Economy of Urban Food Security in Sub-Saharan Africa.” World Development 27, 11 (1999). 1939–1953. Maxwell, D. & Gelsdorf, K. Understanding the Humanitarian World. London: Routledge. (Forthcoming 2019). Maxwell, D & Hailey, P. “The Re-emergence of Famine in the 21st Century.” Special Edition on, “La lutte contre la famine: un mythe de Sisyphe?” Politorbis. No. 66. (March 2018). 13-22. Maxwell, D., Gordon, R., Moro, L., Santschi, M., Dau, P. “Trajectories of International Engagement with State and Local Actors: Evidence from South Sudan.” Journal of Intervention and State Building 12(1) (2018). 98-119. Vaitla, B., Coates, J., Glaeser, L., Hillbruner, C.,* Biswas, P.,* Maxwell, D. “The measurement of household food security: Correlation and latent variable analysis of alternative indicators in a large multi-country dataset.” Food Policy 68 (April 2017). 193-205. Seal, A., Hailey, P., Bailey, R., Maxwell, D., Majid, N. “Famine, conflict, and political indifference. Catastrophic combination for the people of Yemen, Somalia, South Sudan, and Northern Nigeria.” British Medical Journal 357 (2017). 2196-97.